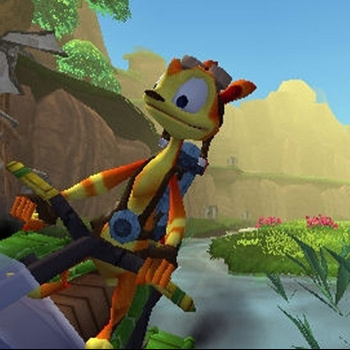 Daxter is centered around the world of the lovable orange ottsel made popular in the Jak and Daxter franchise. The story unfolds as Daxter searches for Jak, who was imprisoned during the events that led to the start of "Jak II." Daxter, now on his own in an unfamiliar place, quickly realizes that being small and furry won't help his chances of survival. To help stamp out a mysterious metalbug infestation, Daxter takes on a job as a pest exterminator, enabling him to explore parts of Haven City in an effort to collect the clues that will lead him to Jak. Daxter allows gamers to play from his perspective offering a distinctive set of moves with agile abilities that allows players to climb walls, creep up on enemies, fit in small places and maneuver vehicles. Taking a job as a pest exterminator, to fight an ongoing invasion of metal-bugs, Daxter comes equip with gadgets to rid the city of these metal nuisances. Get close up and personal by using your flimsy bug swatter to squash an army of attacking insects or your spray gun to hover around a variety of environments while picking up various upgrades.